These downloadable forms can be completed by your physician, psychologist, psychiatrist or other appropriate treating professional to provide appropriate documentation of your disability. Make sure you have a release on file with your treating professional(s) so that they can fill out the form. The forms can be returned to Disability Services via fax at (414) 288-5799, or mailed to Office of Disability Services, P.O. Box 1881, Marquette University, Milwaukee, WI 53201-1881. Most classroom and other accommodations can be approved with minimal lead-time to ensure that they are available when they are needed however, several more-commonly requested accommodations do necessitate additional time for coordination. If you have concerns about receiving an accommodation in a timely manner, please reach out to ODS for guidance on when a specific accommodation should be requested. Considerations for alternatively-formatted media, housing adjustments, and priority course selection are examples of modifications that need to be requested as early as possible rather than after a student arrives on campus to begin classes. A service animal is defined as either a dog or miniature horse that is trained to work or perform a specific task for the benefit of an individual with a disability, which may include a physical, sensory, psychiatric, and/or other intellectual disabilities. Service animals are not required to wear any sort of special collar, vest, harness, or ID card, although they may. The animal must be in control of the handler (though not necessarily by use of a leash) at all times. This means that the animal will respond to commands from the handler, will act respectfully and professionally towards humans and other animals. The service animal must be housebroken and well groomed. The animal can go anywhere that humans are allowed with the exception of situations that may compromise safety or program objectives. Beyond the above two questions, if questions remain about the appropriateness of a service animal generally, or in a specific setting, the concerned party should contact the Office of Disability Services immediately but should not ask for the removal of the animal. Petting or interacting with the animal as if it were a pet. These animals are trained to be focused on their owners, and are considered to be working. If you have any questions about the presence of a Service Animal on campus, please contact the Office of Disability Services at (414) 288-1645. Individuals with a state-issued disability parking hang-tags are not automatically provided with a University parking permit. Students are expected to engage in the parking permit lottery process if they would like a parking permit. A student who may otherwise be excluded from the permit lottery (most often students who are living in University residence halls), who also may require access to a personal vehicle to manage disability-related needs is encouraged to contact ODS to explore what accommodations may be appropriate. To find more information please review the Accessible Parking Policy. Students interested in studying abroad are encouraged to contact the Office of Office of International Education (OIE). OIE can provide information about the availability of accommodations and accessible facilities at various study abroad programs. Laws regarding disability and public facility access vary by country. It is important students recognize that OIE cannot guarantee all study abroad programs will be accessible. However, OIE can assist students in exploring other possible study abroad programs that will meet their needs. Any student who anticipates needing accommodations should provide appropriate documentation to the Office of Disability Services (ODS). Documentation guidelines are located on the ODS Forms page. Once students have provided sufficient documentation, ODS will advise OIE on guidelines for reasonable accommodations and then OIE will work with students to ensure the study abroad site students choose is capable of meeting their needs and/or to identify an alternate location. 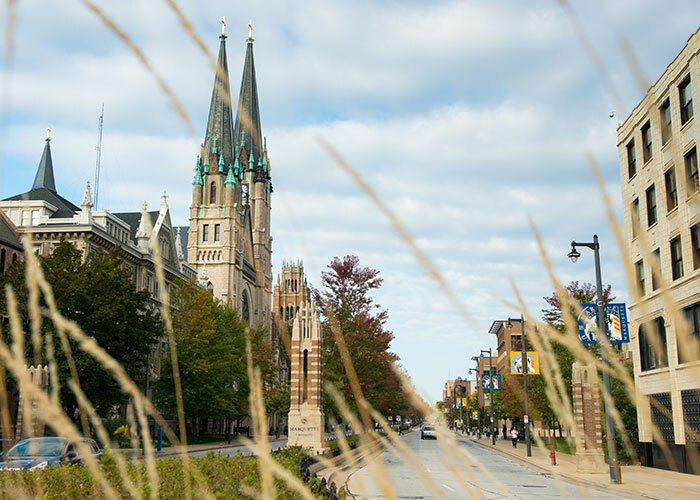 Marquette University is committed to supporting the academic success of all students, but recognizes that certain life events may inhibit this process. Students who suffer from temporary impairments such as broken bones, temporary illnesses, and recovering from surgery or medical conditions are typically not substantial enough to be considered a disability. The Americans with Disability Act (ADA) does not typically recognize temporary disabilities as a disability for which accommodation is legally mandated, however, the Office of Disability Services may be able to provide some assistance and referrals in these situations, but cannot guarantee that services will be provided.